The Triangle reggae scene does not attract a lot of media coverage, but there are a good many reggae fans in our market who turn out to support their music. Both Cat's Cradle and the Lincoln Theatre are well known for supporting reggae acts, but Hillsborough's Blue Bayou -- the Triangle's only genuine blues venue -- also regularly books the reggae band dub Addis. Indeed, dub Addis has become a crowd favorite at the little club on Churton Street and they'll be appearing again at Blue Bayou Saturday. The musician who founded dub Addis is Dereje Tesfaye, a native of Ethiopia. The band name reflects Dereje's origins, as it references the capital city of Ethiopia, Addis Ababa. "I grew up in Addis Ababa," Dereje said. "I was 16 when I moved to the States. That was in 1987. I was a senior in high school at the time. The government was taking that age of student for military service. My choice was either go to war or leave the country. At the time Ethiopia was in a war with Eritrea." What Dereje was fleeing was an Ethiopian regime known as the Derg (Amharic for committee or council), Soviet clients who are best remembered for inflicting the "Red Terror" on Ethiopia. The Derg was finally driven from power in 1991, but by that time the regime had bankrupted Ethiopia, created 60,000 orphans and about 750,000 refugees, one of whom was Dereje. "My brother and sister were already in the U.S. I had to lie about my age -- claim I was 14 years old -- so I could get out of Ethiopia," Dereje said. His exit from Ethiopia began a journey that eventually would lead him to the Triangle. "At first I lived in California, in Los Angeles. I lived there until '93 and then I moved to North Carolina. Los Angeles was just too fast-paced, too busy; I couldn't concentrate on my schoolwork. I had a sister who was living in North Carolina and she told me it was a little bit calmer here, and the cost of living was not as bad as California. When I got here I went to Durham Tech and studied electrical engineering." Dereje had grown up with music in Ethiopia, but he didn't start playing and writing music until after he'd immigrated to California. I started playing music in Los Angeles," he recalled. "I was sitting in with bands, singing. When I came to Durham, I met a lot of people who were doing music, but not all of them were in bands, so we formed a band called Hotep with some friends. It didn't last long, but that's how I got started here. Next we formed a band called African Children, and that lasted until '99. That band was myself and another Ethiopian, Fresew Taye, and two North Carolinians, Bashier Shakur and Vernon Perry Jr."
His musical career was briefly interrupted in 1999, when he moved to Austin, Texas, to help take care of his mom, who had lung cancer. The doctor in Austin told Dereje that his mother had no more than six months to live. She outlived his prediction by a year, however, and during that time Dereje took up his music again. "Some of my old band members came to Austin and we started all over again as dub Addis," he said. "After my mother passed away I returned to Durham and continued with the band." Dereje's musical inspiration, not surprisingly, came from the great Bob Marley. "I used to listen to Bob before I understood English," he said. "The energy in the music and the feel of it captivated me. It was the second music I grew up listening to, along with Ethiopian music. The more reggae I heard, like Burning Spear and Steel Pulse, the more I felt it." Currently, the members of dub Addis are Dereje Tesfaye (vocals, keyboards), Fresew Taye (drums and keyboards), Tre Tomson (bass and guitar), John N'Jie (vocals and percussion), and Wylie Pamplin (guitar). Their sound is roots reggae, mixed with some Ethiopian elements, and their groove in concert is sublime. 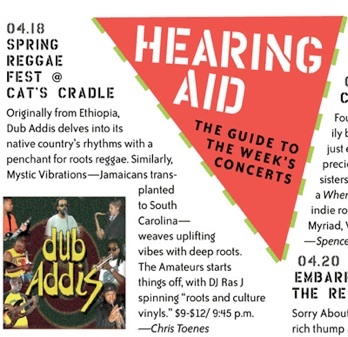 Dub Addis is one of North Carolina's must-hear reggae acts.